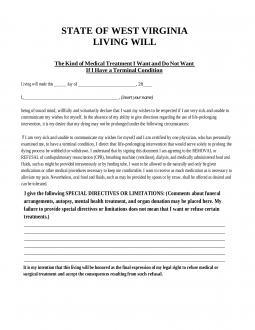 The West Virginia living will is a legal document, written by a Declarant/Principal that shall explain whether or not the Declarant would choose to be on life support if they were to fall terminally ill and likely die without life support, or in the event they should fall into a coma or persistent vegetative state. A living will, is going to state that they either want or will not want, artificial life support if either the Declarant should become terminally ill and would be likely to succumb to death in a short time without the aid of life support of any kind or in the event the Declarant may fall into a coma or vegetative state. Medical Power of Attorney – Give access to making health care decisions on your behalf if there is ever the unfortunate event that you cannot make them for yourself. Step 3 – Section C – Once the Declarant reaches section C, they must read the brief statement and respond with an “I want” or “I do not want” response by initialing the box preceding the selection.